Draining down your caravan is one of those essential winter checks to prevent frost damage to your pipes or water system. It’s also a condition of our caravan insurance policy to drain down your caravan between November 1st and March 15. 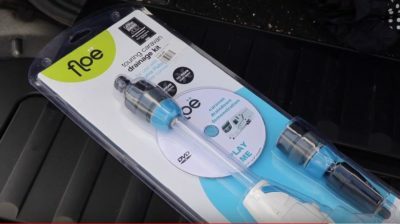 In this video we take a closer look at the Floë caravan drainage kit for getting those last drips of water out of the system and flushing out any stale water. Floë uses compressed air to push out water from your caravan, particularly where it gets trapped in the pipework around your caravan’s wheel arches. You simply connect the kit to a foot pump or air compressor and open each tap in turn to release the water. Experienced caravanner Dan Trudgian had already drained down his caravan before using the kit and blew out an extra 850ml of water from his system. Using the kit also helped to get rid of stale water in his caravan’s pipes, also blowing out biofilm and algae that had been developing in the pipework. For more information about draining down click here. To find out more about Floë visit www.keepfloeing.com. I drain down my caravan as often as I can I usually get 2.5Ltrs of water out of the system. Very interesting video, easy way to clean down your caravan water system for WinterStorage.